A large, cheerful group of OOTA members gathered in the Pavillion in the grounds of the Fremantle Arts Centre for the annual OOTA Christmas party on Friday 8 December. Sharing an eclectic selection of dishes, each prepared by the members themselves, accompanied by sparkling, and red and white wines, members enjoyed several hours of convivial, stimulating conversation and good company. The celebrations were punctuated by several acts of recognition together with prose and poetry readings. Jan Napier paid tribute to the work of poetry tutor Shane McCauley, who recently presented his 300th poetry class for OOTA and whose tutoring and encouragement have resulted in many members successfully obtaining the publication of their poems. 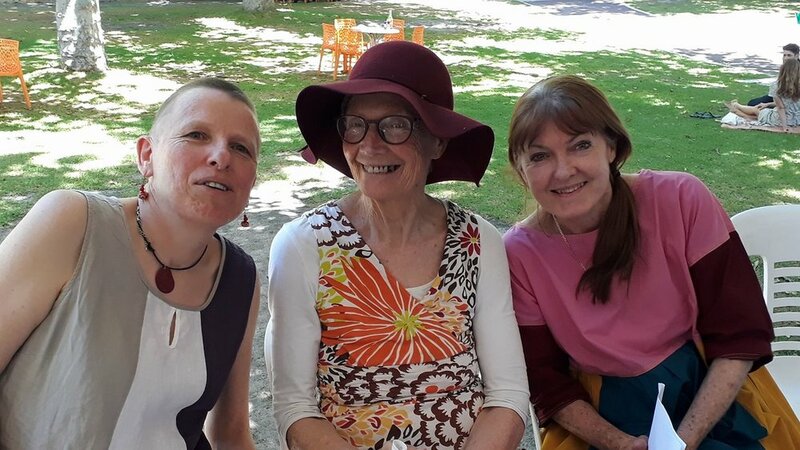 Following Jan, Liz Hearnden paid similar tribute to prose tutor Helen Hagemann, whose workshops and critiquing classes have been an invaluable source of information and inspiration to OOTA’s prose writers. Maureen Gibbons then spoke in recognition of the support and encouragement provided to OOTA by Catherine Noske, the General Editor of Westerly, in whose pages many OOTA members have enjoyed seeing their works published. Catherine is soon to be married and Maureen presented her with a gift on behalf of the Committee, together with their very best wishes for her future happiness. The afternoon was completed by a series of member readings. Rachael Petridis and Gael Williams treated members to selections of their poetry, while Jo Clarke, Rose van Son and Leanne Searle read three very different, but equally entertaining short stories. The OOTA Committee wishes members and their families all the very best for the festive season, and looks forward to another productive and stimulating year of prose and poetry in 2018.